Surf N Sun Backpackers Gold Coast backpackers is an ideal affordable place to stay on the Gold Coast if you are on a budget. We cater to backpackers so if you’re a backpacker you will love that we are located only two minutes walking distance from Surfers Paradise beach and approximately 10 minutes from Cavill Avenue and the Cavill Mall. 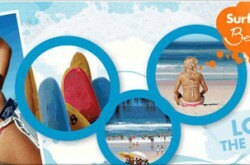 Enjoy a fun-filled, affordable, short stay on the Gold Coast with friends at Surf N Sun Backpackers. Choose from our range of Double, Twin or Dorm rooms. Each room includes a kitchen, bathroom and bedroom/s. Surf N Sun Backpackers is just minutes away from the heart of Surfers Paradise. Go wild, have fun, relax and chill out in the midst of the Surfers Paradise action by day or by night. Come and play in paradise for a real affordable holiday accommodation experience stay and Surf n Sun Backpackers.